Traditional septic systems only work if the soil in the leach area is sufficiently permeable that it can readily absorb the liquid effluent flowing into it. Also, there must be at least a few feet of good soil from the bottom of the leach pipes to the rock or impervious hardpan below, or to the water table. Less commonly, a site can fail because the soil is too permeable, allowing the effluent to reach the groundwater before it is fully treated. Very steep slopes are also unsuitable for a conventional leach field. The specific standards vary from town to town, but any of these characteristics can prohibit the use of a standard gravity-fed septic system. In some cases, a more expensive alternative septic system may be allowed. To determine is a building site is suitable for a septic system, a percolation test (typically called a “perc test’ or “perk test”) is required. On rural sites without municipal sewage systems, a failed perc test means that no house can be built – which is why you should make any offer to purchase land contingent on the site passing the soil and perc tests. As prime building sites become increasingly scarce (or prohibitively expensive) in many parts of the country, rural sites that will not pass a percolation or perc test are increasingly common. In general, soils with high sand and gravel content drain the best and soils with a high clay content or solid rock are the worst. Most soils fall somewhere in the middle with a mix of course sand and gravel particles, small silt particles, and miniscule clay particles – the smallest. If you can form a long, thin ribbon of wet soil, it has a high clay content and my fail the perc test. To get a rough idea before investing time and money in testing, dig below the top few inches of topsoil (loam) to the lighter soil beneath and grab a handful. If the soil has a sticky, damp texture, and you can form a small lump of damp subsoil into a long, thin ribbon or worm shape that holds together, then the soil has significant clay content. If you can form a ribbon of soil 2 in. or longer in the ribbon test, it indicates that the soil has high clay content and may fail a standard perc test. The two main tests used to determine a site’s suitability for a septic system are a perc test and visual observation of the soil in a test pit, sometimes referred to as a deep hole test. Testing requirements vary greatly from state to state and often from town to town, as most states allow individual towns to establish separate rules within state guidelines. So make sure you talk to your town health officer about what tests are needed, when they can be done, and who should perform them. Whether or not a licensed professional is required, it’s a good idea to hire a seasoned expert with local experience as many of these tests have a bit of wiggle room. Most evaluations start with a deep hole test dug by machine to well below the bottom of the proposed leach field – often 7 to 10 feet deep or greater. Soil samples may be taken back to the lab, or visual observations of the soil layers may be sufficient. Soil tests or observations are used to identify the drainage characteristics of the soil, the seasonal high water table, and the depth of the “limiting zone,” where the soil is unsuitable for treating sewage. The high water table is identified visually by looking for “mottling,” splotches or streaks of color in the soil indicating the occasional presence of water. The limiting zone is defined by the upper layer of the water table or impermeable rock or soil. If the limiting zone is too close to the surface to allow for a conventional leach field, then a mound or other alternative septic system may be required. Typically, the water table or impermeable soil must be at least 3 feet below the bottom of the trenches in the leach field. While most soil experts believe they have enough information at this point to design an effective septic system, most states today also require perc testing to directly measure the rate at which water percolates through the soil. The test measures how fast water drains into a standard-sized hole in the ground. The results determine whether the town will allow a septic system to be installed, and system designers use the results to size the leach field. Some municipalities may also require direct testing of the seasonal high water table under certain conditions. For example, this may be required for some types of alternative systems or in areas with a known high water table. The usual approach is to drill small monitoring wells, also called piezometers. The monitoring wells are essentially plastic pipes stuck into holes drilled in the ground. During the wettest part of the year, the depth of water in the pipes is measured. For a system to be approved, there must be adequate clearance from the bottom of the drain field trenches to groundwater. To conduct a perc test, first talk to the local health department official as requirements can vary significantly from town to town as far as who can conduct the test, the minimum number of holes, depth of holes, required absorption rates, and when the tests can be performed. In general, tests cannot be conducted in frozen or disturbed soil, and some areas only allow tests during certain months of the year – so plan ahead. A standard septic system will only work if the soil is sufficiently permeable to water, as determined by a “perc” test. If the test fails, you may need a more expensive alternative system –or the site may be unbuildable. Test procedure. A typical perc test consists of two or more holes dug about 30 to 40 feet apart in the proposed drain field area (see illustration). The holes are typically 6 to 12 inches in diameter and 2 to 3 feet deep, the typical depth of the absorption trenches in a leach field. Next, you or the technician should place 2 inches of clean gravel in the bottom of the hole. Scrape the sides of the hole with a sharp tool (nails driven through the end of a 1×2 work well) to loosen soil compacted during digging, and remove any loose soil from the bottom of the hole. Since the perc test is meant to simulate the actual conditions in a working septic system, the soil is then “pre-soaked” for several hours to saturate the soil. Keep adding water to maintain about 12 inches of water in the hole for at least 4 hours. Clay soils should soak for at least 12 hours to fully saturate. The next day, clean out any loose soil that has fallen to the bottom, and carefully fill each hole with water to a depth of 6 inches above the gravel. Then measure how much the water drops in 30 minutes (or less for highly permeable soil that drains quickly). The times are then carefully documented and used to calculate the percolation rate – the time it takes for the water to fall one inch. The percolation rate is usually expressed in minutes per inch of drop. A rate of 60 minutes per inch (MPI), meaning the water dropped one inch in 60 minutes, is often the cutoff point for a standard gravity-flow septic system, although the maximum number varies from 30 to 120 minutes depending on local regulations. The cutoff for too-fast percolation is typically 3 to 6 minutes per inch. The worst-performing hole is the one that counts. Some towns require that a town official be present to witness the test. Steep slope. The maximum allowable slope for a conventional system typically ranges from 20% to 30%. Filled land. 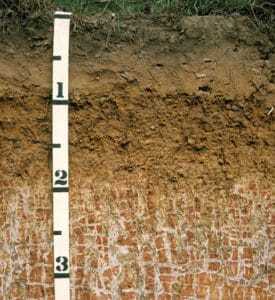 Native soils are typically required, although engineered fill may be acceptable in some cases. Wetlands or flood zones. Not acceptable for leach field. Site drainage. The leach field should not be in the path of runoff during rain storms, which could cause erosion or flooding of the system. House 10 ft. 10-20 ft.
Property line 10 ft. 10 ft. Private well 50 ft. 50-100 ft.
Potable water piping 10-25 ft. 25 ft.
Open water (stream, pond, wetland, etc.) 50-100 ft. 100 ft.
Dry gulch/stream bed 10 ft. 25 ft.
Subsoil drains 10 ft. 25 ft. Even if your site fails a perc or deep-hole test, all is not lost. For sites with high water tables, you may be able to “de-water” the leaching area by strategically placing gravel-filled trenches and subsurface drain pipe to conduct water away from the drain field. You’ll need a highly experienced earthwork contractor, and possibly the help of a civil engineer or geotechnical engineer, to make this work. Also, a wide range of alternative septic systems have been developed in recent years for use on almost any type of site. Find out which systems are approved for use in your area and which might be suitable for your site. In general, these systems cost more and many require pumps, alarms, and other components that require more monitoring and maintenance than a standard septic system. As these become more common and more widely accepted, formerly unbuildable lots may all of a sudden become approved building lots. As with all new building technology, however, look at products and systems with a proven track record in the field. Why Do I Need A Sand System? I have a small house with an older cinder-block septic tank. It has not given me any trouble but now I need to sell. I had a soil test done and the tester said it was fine and that I could put a cheap conventional system. However, the county came back and said no I need a sand system. That’s $5,000 more. Whats’s up? Help! The town or county, or whoever has jurisdiction (sometimes the state) makes the rules and the rules change over time. It sounds like your site did not pass the perc test for a conventional septic system and the country wants you to put in a sand filter – probably as a pre-filter for your leach field. In addition to the extra initial cost, you will probably also need a pump, controls, and alarm to dose the sand filter – all of which adds ongoing maintenance costs to keep the sand filter operating properly. As a first step, I would contact the county health department or DEQ (whoever hands out septic system permits) and get clarification on exactly why you need a sand filter and whether there are any simpler alternatives. A licensed septic system designer can help you figure out what is the best option in terms of initial cost and ongoing maintenance. You can read more on Sand Filters at this link. Best of luck in dealing with the county – never a fun experience! Can Septic System Go On Lot Next Door? I just recently purchased two lots. I wasn’t sure if one lot would perk so I bought the other lot and, just as I thought, one of the lot perks and the other does not. Can I still put a septic system down on the lot that perked in NC? Assuming that the lot is zoned properly for the building type and size you want, then you can certainly build on the lot that perked. If you want to build on the other site instead, you can usually find a way to accomplish this. Often the simplest solution, if the two lots are touching, is to combine them into a single lot – if that’s what you want. If the two lots are not touching, and your sewage line has to cross someone else’s property, then you will need to acquire a sewer easement to run your piping across their land. There is no guarantee they will agree to this, but sometimes money can be a motivator. Finally, if you want to develop both lots separately and use this as a shared septic system, that is often an option as well. At the end of the day, it up to your local septic system regulations and the officials who interpret and enforce them. It’s always best to do your homework first and then meet with them face to face, with all the relevant information at hand and all your ducks in a row. Your knowledge of the local regulations will help you present a stronger case. If you learn that you will need a variance or special permit to achieve your goals, you may want to hire a real estate lawyer and septic system designer. But with one lot that perks, you should have a lot of options. We have kept up septic maintenance since buying our home in 1999 and in many cases have had our tanked pumped more often due to problems we continue to have with a price tag of $2,500.00 each time Most recently, we were told our lines needed replacement. Ok. We proceed to start the process only to be told the soil samples came back and according to the results our soil cannot sustain a septic system and the county cannot issue the permit. Every home within this neighborhood has and continues to have the same problems we do with their system. We are the first however to try and replace the lines. I realize many things can change the top layers of soil, however, going deeper to where the system is, I would think it would take a lot more then my lifetime to encounter this soil problem. Has anyone else encountered similar problems, and if so, please share your outcome. We were informed the county should not have authorized a permit for a septic system to begin with. I can’t tell from your posting exactly what the problem is, but it sounds like your drain field (leach field) has failed. This happens eventually to all drain fields as the soil get clogged over time with solids and grease from the effluent. Failure can also result from the formation of a think slimy layer called the “biomat” that interferes with absorption. This is caused by overloading of the leach field, due to too much water and/or too much organic waste. In your case, it sounds like the problem is compounded by poor native soil that is too dense to absorb the water from your septic system. This is often due to high clay content. Because of the slow drainage, the system is backing up, making frequent pumping necessary. 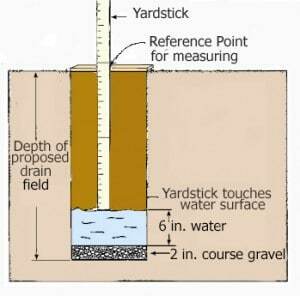 The absorption capacity of the soil is typically measured by a perc test. The most common sign of a failed drain field is a soggy, smelly area over the field where effluent has come to the surface. The septic tank will also fill quickly to capacity and, if not pumped out, the house drains will back up. In some cases, a partially clogged drain field can be rehabilitated, but the only reliable approach is to wait a few years for the soil to recover on its own. If the soil was never suitable for a conventional drain field, then you will need to explore the feasibility of alternative systems. I am surprised that your county health department is not more cooperative in helping you find a workable solution. I suggest that you contact a licensed septic system designer or soils engineer who works in your area. They may have better luck in dealing with the local authorities and can help you plan and install an alternative septic system that is acceptable to them. Until you solve your problem, you should do all you can to can reduce the loading of the septic system. Use water-conserving appliances and fixtures, space out use of the washing machine, avoid use of disposals, and don’t pour any harsh chemicals down the drain. Make sure drainage from the yard, roof, or sump pumps does not collect over the field. As I’ve been looking into the design of our wastewater treatment solution, I’ve learned a bit about aerobic treatment systems. Now I’m not a professional by any means, but from what I’ve seen, you’ll spend less than one pumping, create a healthier treatment system that drains better, and won’t have to pump nearly as often. I would definitely explore this option. And if you have already come up with a solution, I’m curious to know what you decided on. Should Buyer Pay for Perc Test? Hello, I’m looking at a piece of land that has been used as a campsite. It has had no perc tests done and has no well. Houses on adjacent lots in the same area have working septics and wells. The realtor would like me to get a perc test done and have the offer contingent upon passing it, which I would be fine with. He said that I do not have to worry about finding water, but I would also like a contingency for a well, even though I do not plan to build soon. But what is stopping the seller from using me to pay for a perc test, refusing my offer, and then jacking up the price since the perc test will then be on record? Sounds like your real estate agent is representing you as a “buyer’s broker”. If that’s the case, your agent can help you draft a binding offer that is contingent on a successful perc test. You can also have a real estate lawyer review your offer if you want an independent legal review. If the contingency is written properly and the perc test is successful, then the seller is legally obligated to sell you the lot under the terms and price specified in the purchase and sales agreement. Often you can get the seller to share the cost of the perc test. It all depends on the market conditions and the overall strength of your offer. Like everything else in real estate, who pays for the test is a matter of negotiation. Read more on adding contingencies to your offer. Uses For Land That Does Not Perc? I’m looking at a property that may not perk. Assuming it doesn’t, is it possible to have a well put down and power company run power to the property!! I would be using it to store Conex storage containers on. I plan to keep one camper there at all times, and then occasionally have one or two other campers come in for a short period of time. All campers would be using a dump station. Does this sound like something that would normally pass??? Assuming that you do not have access to a municipal sewer, then a perc test is required to build a house or a commercial building with plumbing. Depending on the zoning, land that does not perc is often used for farming, logging, or recreational purposes such as hunting and camping. You may also use it for storage, as you have in mind, if permitted by zoning. A garage, barn, or other storage building might also be allowed. Whether the local authorities will allow you to bring in power and water, and keep a camper on the site, is hard to say. This type of use will be governed by the local zoning rules and how they are interpreted by the officials with jurisdiction. Your intended use may fall into a gray area, so you will need to get input both the health department and department of building and zoning. If at all possible, get their opinions in writing, so you will have documentation if a few years from now a new town officials question your use of the land. This can happen if you decide to sell, build, or otherwise require a permit for some type of work or change of use. Is 60 Minute Perc Test Acceptable? The perc test received on a piece of property says the rate is 60 minutes per inch. How does this help me determine the number of bedrooms I could build? What is an acceptable rate? Most jurisdictions have a maximum rate of 60 minutes per inch (mpi) for a conventional septic system. For some areas, the maximum rate is 30 mpi. You can check your local regulations online or contact the local agency in charge of septic system regulations – usually the health department or department of environmental quality. Higher numbers generally indicate dense soils with higher clay content that do not readily absorb water. The percolation rate determines the size of the leach field required, so a site with a higher number (slower drainage) will require a larger leach field for a given number of bedrooms. Designers assume two occupants for each bedroom in their calculations. If your perc test results are over the acceptable limit, you may still be allowed to build a mound system or other type of alternative septic system. The number of bedrooms allowed is usually determined by zoning or subdivision regulations, not by the perc test, although the perc test can play a role on a small lot if the required leach field size cannot fit on the lot with proper clearances. In some cases, the number of bedrooms allowed is “grandfathered” based on the regulations in place when the lot was originally subdivided. It’s best to check with your local zoning official before proceeding with building plans as the allowable number of bedrooms is not always crystal clear. Best of luck with your building project! We are trying to add two bedrooms and one bathroom to our home. We currently have a 2 bedroom, 1 bath home. We have 5 people in the house now so we NEED more space. The health dept. of environmental services says the home percs for 2 bedroom. She said if we had 4 people in the home instead of 5, she could approve a certain type of permit to allow six people to live in the home BUT because we exceed the 2 people per room “law”, she cannot approve a permit. This makes no sense to me. She said to go ahead and have a soil test done anyway, though. Is that necessary when we already know the house percs for 2 bedroom? Would it possibly make a difference? Sure sounds confusing. Zoning and septic regulations are all created and enforced at the local level, and there is a lot of variation from one jurisdiction to the next, so it is hard for me to say what is allowable in your area. There are often workarounds, loopholes, and gray areas that are subject to interpretation by local authorities. It sounds like this person is trying to find a way for you to move ahead with your project, but is confusing you (and me) in the process. The general assumption in septic system design and permitting is two people per bedroom. So a two bedroom system is designed for 4 people. A four bedroom system is designed for 8 people. It sounds like the health department has some way to allow up to six people to use your current system – or a new larger system – but cannot issue a permit for the extra bedrooms. She may want you to do a new soil and perc test because the old test has expired – or she may be hoping that you get slightly different results this time – not really sure. Also it is not clear whether she wants you to use your current septic system, as is, modify it in some way, or build a completely new, enlarged system. Also if she cannot approve the permit for the extra bedrooms, what’s the point? You will need to ask her for clarification. For best results, schedule a face-to-face meeting with the health dept. to untangle this. Bring someone else to the meeting who is familiar with construction and permitting so you have a second pair of eyes and ears. Finally, even if you are allowed to add a fifth person to your current 2-bedroom system, you should be aware that this will increase the load and possibly shorten the life of the system. It would be wise to pump the system more frequently and to treat the system gingerly: use low-flow faucets and fixtures, avoid putting any products down the drain, avoid drain cleaners and other harsh chemicals. I would like to perform my own perc test rather than hiring a professional. I’ve done some preliminary testing, and I may have too fast of a percolation rate. I dug a hole 6″ in diameter and 24″ deep. I then filled it with water and started measuring immediately. I refilled the hole whenever it was down about 8″. I continued the measurements for 42 minutes. The initial rate was about 100 inches/hr, probably due to lack of soil saturation. The final rate was 13.5 inches/hr. 1. Did I continue the test long enough (42 minutes) for the soil to reach saturation? 2. Would the test be more accurate if I inserted a 4″ drain pipe into the hole, thereby preventing water from permeating the sides of the hole? 3. What would be considered too fast for a conventional system? 4. Are there systems available that are engineered to reduce the rate of absorption? 5. If so, how much might I expect to pay for such an engineered system? 6. Did I provide enough information for you to answer the above questions? I recommend that you contact your local town or health department (or whoever oversees septic system regulations in your area) to find out what procedure is recommended or required in your area. Your test hole seems about right – it should be equal to the depth of your leach field trenches. A minimum of two or three holes are typically tested. Except in highly porous sand and gravel soil, you are generally supposed to saturate the soil for a minimum of four hours and preferably overnight. In most cases, the perc test is conducted the next day. Sounds like you may not have adequately saturated the soil prior to measuring the absorption rate. Typically each hole is filled to 6 inches above a 2-inch layer of clean gravel at the bottom. Some technicians measure the time it takes for the water level to drop to 5 inches and then refill to 6 inches. Others take a precise measurement about every 30 minutes and refill then. In either case, measurements are taken until two consecutive measurements are approximately equal, indicating that the rate has stabilized. The worst performing hole is used to determine the rate. A final rate of 13.5 minutes per inch (MPI) indicates a well-drained soil well suited for a conventional leach field. If you do require an engineered “alternative” septic system, you can expect your costs to be at least twice the cost of a conventional system. Which system would work best for you would depend on local conditions and what systems are accepted by local authorities. The least expensive system with the fewest moving parts is usually the best choice. Typical perc test procedures are described at this link. Excavator Needed for Perc Test? What size compact Excavators is needed to complete a perc test? We need to rent one but are unsure what to get. Procedures vary a lot by jurisdiction, but most perc test holes are pretty small. They are typically about a foot in diameter and should be dug to the depth of the proposed absorption trenches, usually 2 to 3 feet. Two or three holes are typically dug using a post hole digger or power auger on a small excavator. Any compact excavator such as Bobcat or skid steer can work with the right attachment. The deep observation hole, required in many areas, usually requires a hole of 7 feet or more – large enough for a worker to safely climb into. One side is usually sloped for safe access. Most small excavators with the right attachment can handle this, but the bigger the equipment the faster the work will go. Around here, a small to mid-size backhoe is often used. Best of luck with your perc test and building project! What is the difference between a marginal perc site and a regular perc site? Also, have you ever heard of the soil test determining the size of your home, not in terms of bedroom but square feet? Although you can “pass” some college courses with a D, you may not want to hire the college graduate with barely passable grades. Similarly, I would be cautious about a site with marginal perc test results. The term “marginal” is sometimes applied to soils and sites that either just passed or just failed the perc test – indicating that a larger leach field or alternative system may be required for adequate performance. Alternative systems are a lot more expensive to install and maintain than conventional systems. Also a system installed in marginal conditions may be more prone to problems. While perc testing is based on science, the actual tests are governed by somewhat arbitrary rules that vary from town to town, as well as visual observations of soil characteristics (like mottling) which are somewhat subjective. For example, some towns require testing during the wet season, while other allow testing year-round. A site that just passed during very dry weather might flunk during a wet spring when the soil is saturated and the water table higher. Yet the septic system must perform under all weather conditions. Some towns require an engineer or town official on hand; others do not. Sellers have a strong incentive for a site to pass. In areas with less rigorous test procedures, it’s possible that someone could skew the test results of a marginal site into a passing grade in order to make a lot marketable. Regarding your second question, no, I have never heard of a soil test limiting the size of a home. In general a septic system is designed for a number of bedrooms, with the assumption that each bedroom will have up to two occupants. What exactly counts as a bedroom does vary from town to town. Some towns are pretty loose in their definition; others are very strict and will not let you build any extra “bonus” rooms or other finished spaces that could be used (or easily converted) to a bedroom. It’s also possible that the size and location of the required leach field and replacement field, along with property setbacks and other zoning regulations, may leave a buildable area too small for the house you have in mind. We recently purchased land and had a perc test performed. We live in Menifee, Ca. When we went to mark where we wanted or home placed, we were told it could not be possible because the perc test markers are there. Is this accurate? If so, I do not understand why the company would not ask me where we wanted to place our home before performing the test. Any advice? Typically, the approximate house site, well location (if needed), and leach field area are planned in advance of conducting a perc test. It’s hard to say why the testing company did not discuss these issues with you and chose that particular spot. Sometimes, there are limited options for siting the house and septic system due to the required setbacks and clearances, and to the location of suitable soils and site conditions, including slope, surface water, and depth of the water table and ledge or impermeable soils. Septic systems have to be a certain distance from the house, well, property lines, water lines, streams, etc. Some towns require both primary leach field and a designated replacement field. It may be that this was the only suitable spot for a leach field. Or it’s possible that your tester jumped the gun and picked the spot based on easy access or incorrect assumptions about your building plans. In any case, they should have discussed the site plan with you ahead of any testing. I would suggest contacting the local health department (or dept. of building inspection), which typically oversees septic testing and permitting. If you find out that you have other options for locating the septic system, then get back in touch with the testing company. Hopefully, they will cooperate and re-test, if necessary, in the proper location. Is Perc Test Transferable to Buyer? I am looking to purchase a lot in Ohio. The current owner had a perc test done and passed. Can that same test be transferred to me? In general, perc tests run with the land, not the owner. So the test should be transferrable as long it was properly done and has not expired. Depending on the local regulations, test results may be valid for one to five years or more, and in some cases can be renewed for a fee. A perc test, however, is not the same as a permit to install a septic system. This takes into account other factors such as lot size, setbacks, site drainage, and the number of bedrooms. Building permits and septic permits are generally not transferrable. In some towns, the perc test results need to be reported to the local health department and are a matter of public record available to you upon request. In all cases, the test would need to be done in accordance with local law to be valid. Since rules vary so much from town to town, it’s best to not make any assumptions. Make any offer contingent on your review and approval of the perc test results. If your offer is accepted, contact the local health department or department of building inspection to confirm that the lot is suitable for the building you have in mind. You can also contact a local septic system design firm for help if you cannot get clear answers from the town or county. Best of luck with your lot purchase!